Emory Saint Joseph's featured on "The Doctors"
Emory Saint Joseph's Hospital and Resurgens Orthopaedics spine surgeon Paul Jeffords, MD, were featured on a recent episode of "The Doctors," a television program featuring a panel of top medical professionals that weigh in on health issues raised by their guests. After meeting a patient on the program who had experienced several medical issues resulting from a broken back, Jeffords performed a life-changing corrective surgery at the hospital. Since falling from a horse eight years ago, patient Stephanie Smithwick had experienced debilitating pain, as well as three surgeries, which included inserting screws into her lower back to help fuse the bones together. "Stephanie had a traumatic injury to her spine, and she may have had a spinal fusion that did not heal correctly," says Jeffords, describing the screws and rods that had loosened and were protruding through Smithwick's skin. 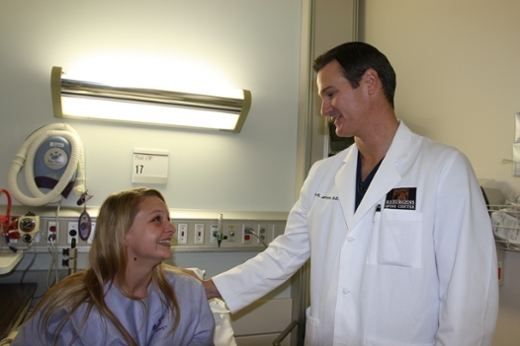 To watch the episode of "The Doctors" featuring Smithwick's successful surgery, click here.